Veterinary Physiotherapy available at Portland Vets. At Portland Vets East Grinstead we are able to offer physiotherapy sessions to both our patients and those from other practices. Conditions treatable with physiotherapy include sprains and strains, back pain, post-operative rehabilitation, neurological diseases, nerve injuries, arthritis, tendon problems, cruciate disease, hip and elbow dysplasia, carpal deformities and many more. Physiotherapy is a science-based profession, aimed at restoring and optimising function, performance, mobility and independence. Veterinary Physiotherapy initially involves a thorough assessment, then an individualised treatment plan. Which could include manual therapy (joint mobilisations, soft tissue work), electrotherapy, exercise programmes, advice, splinting or taping. All physiotherapy treatment to any animal must have veterinary consent as a legal requirement, under the Veterinary Surgeons Act 1966. Ciara Foden BSc(Hons) PGDip. is a Chartered Veterinary Physiotherapist, dividing her time between human and animal patients. She has always had a great passion for animals, with particular interests in musculoskeletal problems and behaviour, plus wildlife and conservation. Appointments for Ciara or to discuss referral please call Portland Vets 01342 327799. She is fully insured and registered with ACPAT (Association of Chartered Physiotherapists in Animal Therapy), CSP (Chartered Society of Physiotherapy) and HCPC (Healthcare Professions Council). HM Veterinary Physiotherapy was set up by Harley Saunders BSc(hons) PGDip. Veterinary Physiotherapy and she prefers to come out to the pets home to perform her physio. 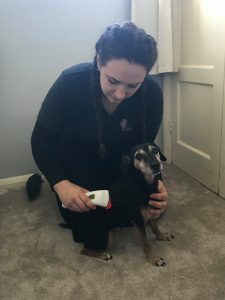 She worked for many years at Portland Vets whilst gaining her qualifications and her close work with the veterinary profession has been invaluable. She is also a very keen equestrian and performs physio treatment on cats, dogs and horses. Please contact Portland Vets for more details and to request a referral. She is also fully insured and registered with National Association of Veterinary Physiotherapists.